Ken Prairie was a journeyman printer and staff representative for the Print Sector for almost five decades. He died Sunday at the age of 86. His memorial service is June 16. Ken Prairie, a veteran California-based CWA staff representative who helped newspaper printers through strikes, mergers and technology upheavals, died at his home on Sunday. He was 86. A funeral mass will be held Monday, June 16, in Ventura. Family members said he was diagnosed with pancreatic cancer in March. He continued to work until just a few weeks before his death. His five decades in the union trenches of the newspaper business spanned an often heart-breaking period of technology transformation and industry change, which wiped out composing room jobs in city after city. “He saw the whole story, from cold type to the situation today where it’s all on computer screens,” said Duane Beeson, the veteran Oakland labor lawyer and a frequent ally. Mr. Prairie began learning the printer’s craft when he was in high school, and he served as an apprentice at The Ojai, his Southern California hometown weekly, until he and an editor started a competing weekly in 1951. After selling his interest to his partner, he worked in composing rooms for several newspapers including the Santa Paula Chronicle, the Ventura County News, the Santa Barbara News Press and the Ventura Star Free Press. 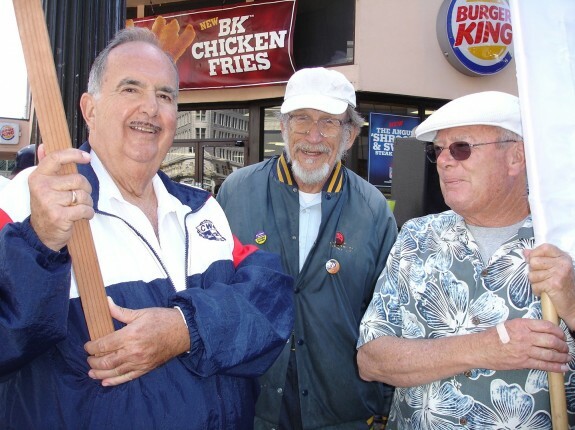 Ken Prairie, Harry Siitonen, and Charlie Tobias join in a rally in downtown Oakland for workers from the Hayward Urbanite plant when they were negotiating a contract. Photo courtesy Gloria La Riva. He was active in Ojai town politics as well as union affairs from his earliest days in the printing trade. He was the President of the Ventura Typographical Union from 1956 to 1960, when he took on an assignment for the International Typographical Union in Los Angeles. A year later, he became a regular ITU representative. When the union merged to become the Print Sector of CWA, Ken became a CWA staffer, starting in 1987, and remained on the union staff, working in the field, mostly in California, Hawaii and Nevada, until his illness curtailed his ability to travel. He was still making calls even from home as long as he was able. His dapper attire, well-trimmed mustache and quiet persistence were familiar to generations of newspaper industry labor leaders and management lawyers in the Bay Area and Hawaii. Ken Prairie and the bargaining team at signing of first contract with Design Action Collective. Photo courtesy Gloria La Riva. 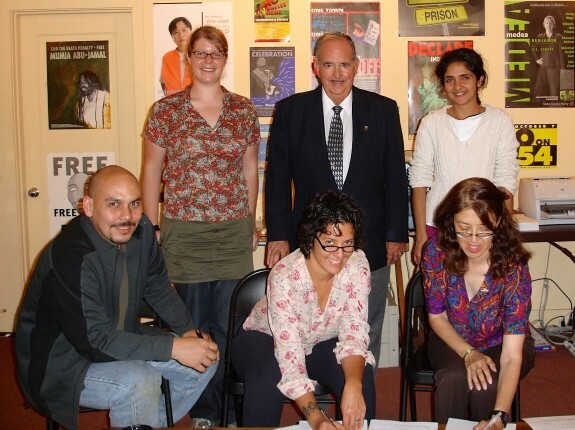 One of his larger ITU affiliates, the former Bay Area Typographical Union, eventually became part of the Pacific Media Workers Guild, whose current local number, 39521, reflects the merger of the Newspaper Guild Local 52 and BATU Local 21. Charles Tobias, former president of Local 21 and the Media Workers Guild Typographical Sector, recalled Ken as a professional who always looked the part, even during the heat of such battles as the 1994 San Francisco newspaper strike, when his coat and tie may have been the only ones in the room. Dave Ellis, retired staff representative and former president of the Mailers Union, Teamsters Local 15, negotiated side-by-side with Mr. Prairie on behalf of workers at the Dallas dailies in Texas during the early 1980s. “He made a tough job look easy — he was the consummate negotiator. Even in the difficult environment of a right-to-work state in the South, he could get a contract,” Ellis said. “He was not going to go into that meeting with management, wearing a stained shirt,” Ellis said. “He knew the names of everyone he ever worked with, decades back. That was extremely useful for the union, because he knew what the issues were in long-ago negotiations, and their evolution and what was useful today. He had enormous experience in negotiating,” La Riva said. He knew the value of salving wounds and maintaining the fighting spirit during an extraordinarily tough period for all of organized labor, and particularly for union printers, adjusting to the computer era and shutdown of most metro composing rooms. “My favorite times with him were after a tough time negotiating or some other setback for the union, we’d be sitting in my office and we would just look at each other and say, ‘Let’s go get some ice cream.’ Or coffee. He loved coffee,” La Riva said. If he ever lost his cool, it didn’t show. Kenneth Nicklas Prairie was born Oct. 3, 1927, in Ojai, the youngest of three brothers. Survivors include his wife, Dorothy A. (Hobart) Prairie; four children, Susan A. Rosario (Tony), Michael W. Prairie (Hiromi), Bonnie P. Ryan (Kevin) and Lucinda G. Garner; eight grandchildren; one great grandson; and one nephew. A visitation will be held at Ted Mayr Funeral Home, 3150 Loma Vista Road, Ventura on Sunday, June 15, from 3 to 4 p.m., followed by a vigil service. The funeral mass will be held at the San Buenaventura Mission, 211 E. Main St, Ventura, on Monday, June 16, starting at 10 a.m.
Condolences may be left at TedMayrFuneralHome.com. 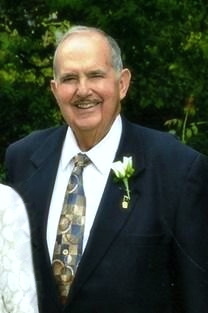 An obituary provided by the family can be found at dignitymemorial.com.